You can download this Kindle version eBook to a computer or smart phone (check apps. first, if not sure she should contact the Cust. Support for her iPad and ask them about pdf file apps. for the iPad). I hope this helps, Be Blessed! 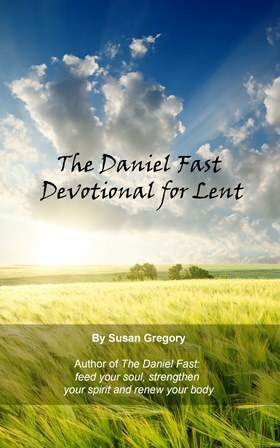 I ordered the Daniel Fast Devotions for Lent Kindle version and look forward to starting on March 6. But I have a question…………I have a friend who also wants to order the book but does not have a Kindle, only an iPad. Can the e-version be purchased and downloaded to her iPad if she does not have a Kindle? There is no specific time of day to eat or portion size for the Daniel Fast. We do advise 3 moderate meals per day with 2 small snacks. Here is a general food list to help you: All fruits, All vegetables, All whole grains, All Nuts and seeds, All legumes, All quality oils. Beverages: spring water, distilled water or other pure waters, and yes, tap water is good, if that is all you have available. MISC Items: tofu, soy products, vinegar, seasonings, salt, herbs and spices. For a complete list you can order a copy of the Daniel Fast Guidelines by going to http://www.daniel-fast.com and enter your email address, they will be emailed back to you. Also, if you to go to http://www.daniel-fast.com/about.html there is a wealth of recipes, and spiritual aids to help prepare, strengthen, build up and encourage you in your journey. I hope this is an encouragement, Be Blessed on your Fast! 1. Is there a guide line or daily program available in terms of what to eat at specific times of the day? 2. What are the portions you are allowed to consume? I have been truely blessed with the daily Daniel Fast devotional readings. Although I could not fast due to a health challenge, I was fasting on His word and becoming stronger in the Lord. I feel good & am back to myself, praise God. Keep up the good work. You are blessing to many people. Thank you so much!! Thank you for your post, and kind words. There are no plans currently to do a paperback version of the Lent Devotional…But you never know!Be Blessed! I am really enjoying this devotional and learning so much during this season of Lent! I am only able to download the ebook to our family computer in the living room and find that I tend to get distracted by everything else on my computer (email, news, etc.) I do a lot better with an actual book away from my computer. Will your ebook devotional be published in a paperback version in the future? what a blessing this book is for those of us seeking a deeper relationship with the Lord during this precious time of the year. thank you! Thanks. I thought so but wanted to double check. Flavored waters . . . it all depends. The main thing is that the only beverage on the Daniel Fast is water. So, if the flavored water you are talking about is still water and free of all sweeteners, chemicals or artificial ingredients, then it would probably be okay. However, the fact that it says “naturally sweetended” makes it one that would not comply with the guidelines. I hope this helps! Christine, thank you for sharing your journey with us! God is good, and it is truly a joy for us to be a part of encouraging His people on in their high calling! Be Blessed on your fast! I came across this water called Glaceau Vitamin Water ZERO naturally sweetended. Under the Nutrition Facts is shows 0 sugars. Can this also be used as water during the fast? I don’t have Kindle but am getting it on my computer and I phone. Thank you for sharing your excitement and enthusiasm for the things of God during your upcoming fast. Be blessed as you continue your fast . . . and as you continue to grow in the love and knowledge of Jesus! You can download this Kindle version eBook to your computer or smart phone (check your apps. first, if not sure contact the Cust. Support for your pc or phone). Be Blessed! Yes, you should be able to download this Kindle version eBook to your computer or smart phone (check your apps. first, if not sure contact the Cust. Support for your pc or phone). I hope this helps! You can download this Kindle version eBook to computers or smart phones (check your apps. first, if not sure contact the Cust. Support for your pc or phone). I hope this helps! Thank you! I just stumbled onto your site today, and I started the Daniel Fast to continue on through Lent, so this will be perfect! 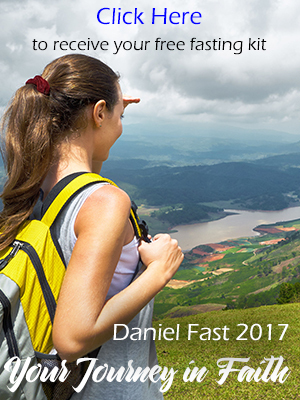 I successfully completed the 21 day Daniel’s fast. I must say, it was not at all difficult for me as I live in Europe and organic food products are very easy to get in any super market. May be what was hard (apart from drinking just water in these below freezing temperatures) was to combine it with spiritual awareness. With your gift, I will now try to focus! Thanks again, Susan and wish you a fulfilling Lent. I would love to get the devotional this is my first time observing lent but I don’t have a Kindle. If you don not have a kindle device, how can get it on my wireless phone or pc.? I am looking forward to this time of fasting for the next 40 days and will seek God’s will in my life. Some things he is working in me are financial, health, career, fasting, family, myself (not necessarily in this order) . God has always taught me various things about myself spiritually, personal, physical, discipline, depending on him. He always has blessings, sometimes corrections, love, forgiveness, and wonderful unexpected surprises for example 2 1/2 years ago I found myself going on a mission trip to Africa with Joyce Meyer Ministry. Thank you so much for this initiative Susan! What a perfect present for Lent! Bless you….